You are going to Watch One Piece Episode 377 English dubbed online free episodes with HQ / high quality. Stream Anime One Piece Episode 377 Online English dub The Pain of My Crewmates Is My Pain! Zoro’s Desperate Fight!While almost everyone on the island is knocked out in the blast, Zoro slashes Kuma with Shishi Sonson, but sees that it is ineffective, as Kuma is a Pacifista, a cyborg whose body is harder than steel. Seeing that he can no longer fight, Zoro offers his life to save Luffy, saying that he cannot hope to become the world’s best swordsman if he cannot protect his captain. Sanji attempts to take Zoro’s place, but Zoro knocks him out. 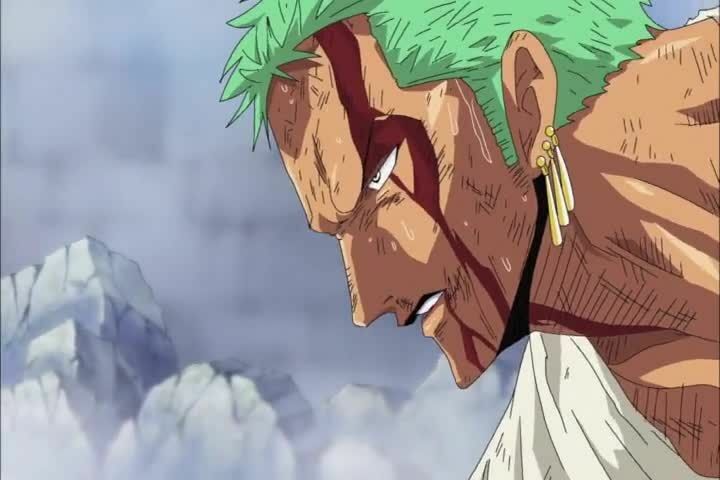 As part of his agreement with Kuma, Zoro takes in all of Luffy’s pain and fatigue, which Kuma says would kill him if he suffered it on top of his already severe wounds. Zoro takes in the pain, and Kuma leaves, remarking on how Luffy has a loyal crew. Luffy regains consciousness, surprisingly energetic, while Zoro emerges from his sacrifice near death. 5 / 5 - 103 ratings.